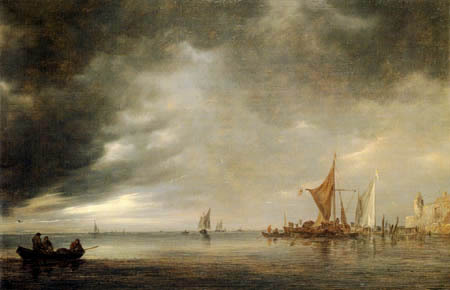 Jan van Goyen is one of the most brilliant landscape painters of all time. Jan van Goyen is almost unrivalled as a master of representing space. mastery and realize that it is not a simple matter of course. reinforce the entire construction of his composition. write (and it would therefore be the reverse for, e.g. Chinese people). how the way the sonnet ends is prepared and called up in earlier lines. to the surface of the painting. motion, with their sails fixing the direction of observation. not a photograph of what we would have seen had we been there. a ‘threshold’, the dark strip in the foreground. of reality, his own ‘song’ about the beauty at the calm mouth of a river. elements, it is not easily forgotten. Fathers pass it on to their sons. in connection with the work of van Goyen’s son-in-law Jan Steen. Published in Dutch in Kunst en Amusement, Kok – Kampen, 1962. The Complete Works 3, Piquant – Carlisle, 2003. Also obtainable as a CD-Rom.